Today, technology is all about enabling business. Organizations of many types and sizes are developing, upgrading or replacing mobile applications to reflect changes in the workplace. Across industries, employees are working more while mobile, using multiple devices. When they return to the office, they are capitalizing on more flexible work environments and approaches to work. 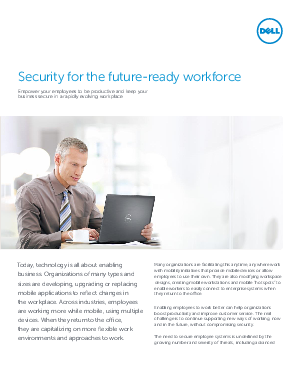 Many organizations are facilitating this anytime, anywhere work with mobility initiatives that provide mobile devices or allow employees to use their own. They are also modifying workspace designs, creating mobile workstations and mobile “hot spots” to enable workers to easily connect to enterprise systems when they return to the office. Enabling employees to work better can help organizations boost productivity and improve customer service. The real challenge is to continue supporting new ways of working, now and in the future, without compromising security.